HYDROLOGY, CLIMATE, AND agriculture work together to shape our understanding of water quality in our watersheds. Dr. Merrin Macrae, associate professer and researcher at the University of Waterloo, looks at how water moves, where it moves, and availability in agriculture landscapes. How does the way we manage the land affect water quality and movement? How should we make management decisions? These questions are some that Macrae asks while researching. Macrae has received funding from Grain Farmers of Ontario and other organizations to look at landscape soil sensitivity to phosphorus loss and more recently land management strategies to reduce phosphorus loss from agricultural fields. Macrae did not start out researching agriculture but found her way there. She completed her undergraduate degree at York University with a double major in environmental studies and geography. She found an interest in hydrology during her undergrad and began learning more about sub-arctic and tundra ponds. Her Masters focused on tundra ponds; looking at carbon and greenhouse gases. “I didn’t start with a plan. I thought I was going to school to be an environmental lawyer. I didn’t plan what I was going to do. I just went with what I liked,” says Macrae on her journey to her PhD and current research projects. During her Masters, Macrae noticed how important snowmelt was to the annual cycle of northern ponds. She started to focus on how snowmelt ran off fields. She moved over into agriculture research to complete a PhD at Wilfrid Laurier University. For Macrae, agriculture research is a two-way conversation. “I had a background in water and phosphorus, and how they work together. The practical knowledge, like the agronomy and the equipment, were new to me. This meant that I had a lot of learning, which was good. I was listening and learning, while I educated others about the water and the chemistry,” says Macrae about her early research. Macrae is currently leading a research project ‘Landscape sensitivity to phosphorus losses: biogeochemical analysis of Agriculture Soils’ which is expected to wrap up in May 2019. It focuses on determining soil stratification of available phosphorus across different soil types, soil retention of phosphorus in soil and environmental conditions, and soil absorption capacity of phosphorus. Previous research on phosphorus loss in soil has mainly been conducted in the U.S., but Macrae wanted to look at the same research in Ontario soils. She wanted to find out if there is something different about Ontario soils and how they hold phosphorus — does our soil hold phosphorus differently in mid-western Ontario, than in the southwestern end of Lake Erie. 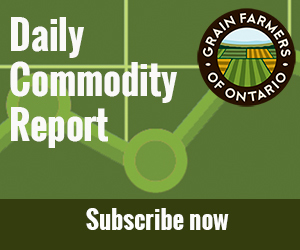 “At this point, Grain Farmers of Ontario provided us with funding. Before this we had funding from the Ontario Ministry of Agriculture, Food and Rural Affairs (OMAFRA) for the Ontario sites. Grain Farmers of Ontario bridged the gap between testing in the north and the south,” says Macrae. Janina Plach, a post-doctorate researcher, assisted in the research and lab work on this project. She found that there is more calcium and carbonate in Ontario soils, which means the soil holds nutrients more tightly. The clay sites do not hold phosphorus as well a silt loam sites. JANINA PLACH, POST-DOCTORATE RESEARCHER, COLLECTING SOIL. PHOTO COURTESY OF JAMES COBER. Macrae points out that when tiles are leaking more, it is not just hydrology, it is also the chemical reactions in the soil. Macrae is also working on a new research project that is receiving Grain Farmers of Ontario and Canadian Agriculture Partnership funding. ‘Reducing Phosphorus Losses from Agricultural Fields: Developing Solutions for Ontario Farmers (water quality)’ compiles many years of water quantity, water quality, and climate data over several fields across the province. “It was an undertaking to get data across multiple sites. Data sets like this are rare… there is power in long term data. This lets us filter the annual noise about different weather like wet or dry years. In my research group, many researchers worked together on this data set,” explains Macrae about the significance of collecting long term data. This data will help Macrae’s team make management decisions for farmers, so they can rely less on Ohio or Indiana data. “A single management strategy across Ontario does not make sense. In the sloping soils in mid-western Ontario and eastward, erosion control should be a priority, but in the southwest, they need to be more careful with phosphorus coming through leaking tiles,” explains Macrae about better understanding management practices across Ontario and in heavy clay soils. Macrae says the take-home is most water goes through tiles and most farmers have less surface runoff. Tiles are a source of phosphorus runoff because so much goes through them. That does not mean that tile drainage is making phosphorus loss worse. Tiles help reduce surface runoff. Management decisions depend on where someone lives, their soil, and the soil chemistry. She suggests that farmers must manage the surface and subsurface phosphorus runoff. “We have to assemble all this data. Take a hard look of what we have, which is just one part. The larger part is communicating the research with farmers, Certified Crop Advisors, industry partners, and governments to get information in the hands of people where they need it,” says Macrae. “I look forward to working with provincial and federal governments, and with PLATO to incorporate this information into the tool,” explains Macrae.